Apparently my procedure for sending mails is not working like it should. Yesterday I updated DG Tournament with the Euro 2008 fixtures. Today I used a screen in my admin module to send out a mail to announce it to the people who played with the World Cup 2006 app. The initial program, created in 2006, supported one tournament. At the end of 2006 it got rewritten to support multiple tournaments. Apparently I missed in my mail procedure a parameter to only send mails for the current tournament (more technically in the WHERE clause). I want to deeply apologize for the "spam" some of you may have had. I will never forget a quote of Tom Kyte: "It ain't so much the things we don't know that gets us in trouble. It's the things you know, that just ain't so or just ain't so anymore or just ain't always so." If you're a football enthusiast like me, June 7 will be marked in your agenda! The start of the EURO 2008 tournament is coming closer. My country (Belgium) is not making part of the participating teams. I find it also a pity that England won't be there as I'm a huge fan of David Beckham. Some people don't like him, but have a look at this video from this weekend! Although my favorite teams won't play, Euro 2008 will still be worth to follow! One of the matches I really look forward to is the Netherlands against Italy. Do you remember the World Cup 2006? At that time I created an APEX application to keep track of the scores. It got extended so you could also bet on the games and that was so much more fun. Some people asked me to do it again in for Euro 2008, so here we are. A few weeks before the start of the tournament, I'm happy to say DG Tournament is open for you to play again! I think it's an excellent chance to bet with your colleagues, family, friends or enemies ;-) You can bet on the games for free, it's just for fun. As this application was also created to promote Oracle Application Express, we give the person who wins the bet a free ticket for our European Apex Training Days in September in the Netherlands. But as the application is also open for others we also give you the choice for an iPod Shuffle. If there are other people or companies wanting to sponsor, feel free to write me a mail or add a comment on this post. The initial goal is to have a lot of fun again, but if we can win something it's always nice too. This morning I patched my local Application Express installations to 3.1.1. I went to Metalink to download the patch. The full APEX 3.1.1 installation is also available now. Unzip the file and read the Patch notes. Basically I had to login as SYS on my 11g database and run apxpatch.sql. After 4:36 minutes my APEX 3.1 was patched to 3.1.1. The only thing left to do was to copy the images directory. This is different if you run Apache or the Embedded PLSQL Gateway. A few seconds later I was done. Nice if everything is going so smoothly! Thanks APEX-team. 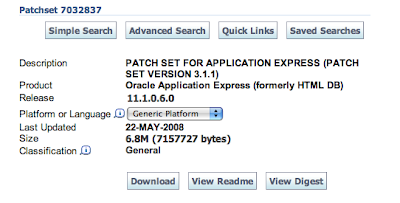 Joel Kallman just blogged that the Oracle Application Express 3.1.1 patch is released on Metalink. As it's already night in Belgium, I'll have a look at it tomorrow. The full version will hopefully be available by then too. It's not that long anymore before Kaleidoscope is starting. On Sunday there is a full day Case Studies, titled: "The Seasoning of Application Express – Must Hear Success Stories". Together with one of our clients we present "Oracle Application Express: Power to the People ", a non-technical presentation, but it will show how people adopt APEX in one of the biggest biotechnology company. On Thursday I'm also on stage for the APEX vs. ADF Shootout. Together with my friend, Lucas Jellema, we'll try to show you both environments and talk when to use what. When we did this talk in the Netherlands in December it was really fun. The public at ODTUG will be very different, so I'm curious to see how it will go. As a lot of European people might not have the opportunity to fly to the States, my friends at AMIS are organizing an ODTUG Sneak Preview. This event is completely free, but you'll have to register for it. Some of the presentations that will be at ODTUG, will be hold on the event. As you can see in the agenda, I'm also doing one of my presentations. Some people asked when I would be in the Netherlands, so you might catch me there. Or you can come to our European APEX Training Days in Utrecht in September. 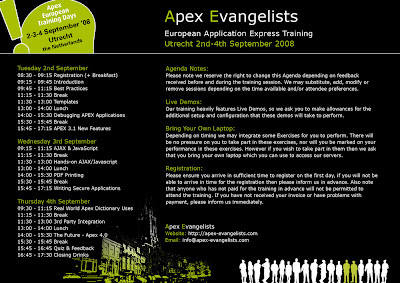 It's starting to become a tradition... After our successful Oracle Application Express training days in Brussels (September 2007) and London (March 2008) it's time to announce our third European APEX Training Days. This time it will be held in Utrecht, the Netherlands. The environment will be a bit different. We didn't go for the Plaza hotel, instead we went for a green "theme". The setting and architecture of the Mitland hotel make you feel as if you’re in the middle of the countryside! Nevertheless, it's only 5 minutes from the city of Utrecht. Below you find the agenda. 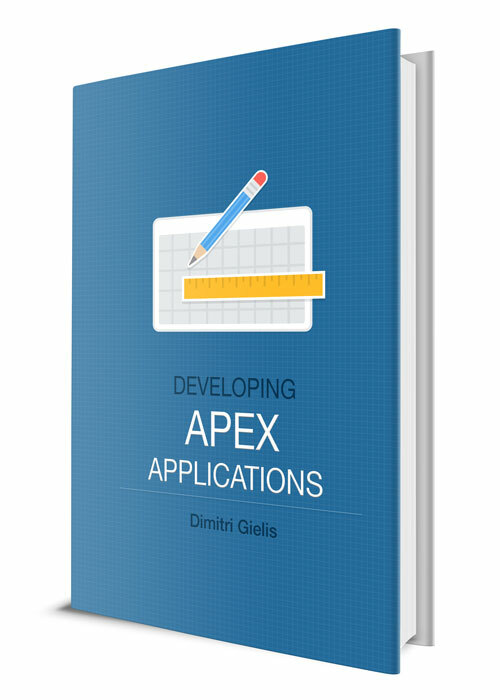 Depending feedback we might change some topics, but these are the topics we believe will bring you to the "next" level APEX developer. You find more information about the training days at the website of Apex Evangelists. OracleNerd, aka Chet Justice, wrote a blogpost that his poll about "Have you used Oracle Application Express" doesn't have that many votes for APEX. I believe he's getting a bit worried, so I decided to call the tight APEX community to vote for APEX on his survey. Lets give OracleNerd a warm APEX vote, so he also feels a bit better! The last days it's really hot in Belgium. 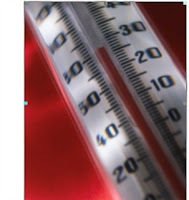 Working when it's hot is not good for our brains and the computers as they get overheated. In the last couple of days I had to use the flashback feature of the Oracle database more than the last 6 months together. 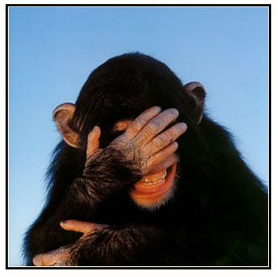 When you get a mail like: "I had to change something, but accidentally deleted the whole text. Can you please put it back?" At that time you're so glad you use an Oracle database! Can you do something like this in MySQL or MS SQL Server? I'm happy the sun is shining and I'm using an Oracle database during these days. I updated apexblogs.info with a Blog Roll on the right side, so next to clicking on the arrow after Blog Selection, which would slide down and show you the aggregated blogs too, you have a link to all APEX blogs. I also added support for Windows Live blogs. So if you've a blog like Jason Aughenbaugh, you can get aggregated too. If you're also blogging about Oracle Application Express (APEX), but don't find yourself in the list, please put a comment on this entry and I'll add you. If you don't have a blog yourself, but want to do a blog post with somebody or just share your ideas, that's also possible. Login to the site (if you don't have a login, create one for free) and go to Your Posts. In there you can write your blog post and it will be shown in the aggregated blogs screen.